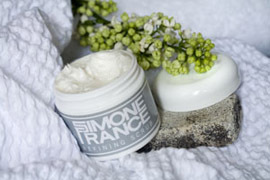 Simone France sent us over quite a selection of their skin care products for review. This is a different way to do skincare. 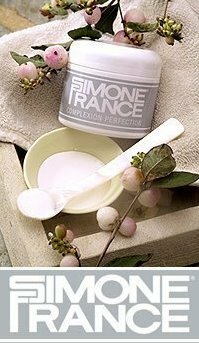 Simone France uses what they call “The Sandwich” to get any skin type to look and feel it’s best. 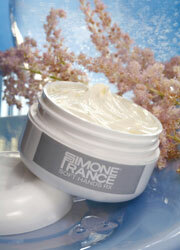 Simone France is a long time favorite of celebrities like Madonna, Amber Valetta and the beauty editors at Vogue. Let’s check em out. Pleasant smell. Leaves skins feeling super soft. Perfectly gentle so you can use it daily. You won’t believe how soft, fresh and young your face will look and feel the moment after you use these unusual polishing grains. Refining Scrub melts as you add more water, so you can adjust it to the perfect texture for your individual skin. 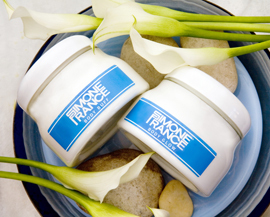 It is a key component of the Simone France Sandwich® that provides gentle daily exfoliation and deep pore cleansing. This is not your average scrub! Make sure you use it only as directed in The Sandwich® for a most unusual and effective anti-aging, skin-firming treatment. This one is fragrance free and works on all skin types. Lathers well. Really gets the job done. This superlative, pure, unscented soap, when used in our unique Sandwich®, becomes the best possible cleansing agent for your skin. The long-lasting, hard-milled bar instantly works into a rich, abundant lather. Great for both face and body. Love the citrusy scent. Wonderful aroma of fresh lemons fills the bath. Gentle and effective exfoliant. Proper exfoliation of the skin on your body (not too much, not too little) is just as important for healthy, soft, younger-looking skin as it is on your face. Our Body Buff gently exfoliates and smoothes your skin while organic aloe and organic oils of sunflower, safflower and coconut soften and hydrate. Natural oils of sweet orange and tangerine provide an ultra-light scent. It will not leave a slippery residue in your shower. No fragrance, glides on easily. non-greasy. Gives skin a moisturized and healthy glow. A bevy of anti-oxidants and all-natural ingredients including organic aloe, organic honey, grapeseed oil, sweet almond oil, neem oil, rosemary emu Oil and vitamin E heal and moisturize your skin leaving it soft and velvety all day long. Some skin lotions treat only the top layers of your skin, leaving it feeling slick or greasy. Others simply disappear leaving no moisturizing protection at all. The unique combination of all-natural ingredients in Body Glow combine to moisturize all layers of the skin, so the skin on your body is just as fresh and glowing as the skin on your face. Body Glow is ideal after showering with Body Buff or any time your skin needs quenching. Comes in a convenient pump bottle. Like the Fountain of Youth for your hands this velvety, ultra-rich anti aging hand cream works wonders. Its unique allantoin formula soothes over-exposed skin and leaves it feeling soft and smooth. Don’t let your hands make you look older! Turn back the clock with this intensive skin care therapy. Want to keep up with all things Simone France? You can like em on Facebook and follow em on Twitter. Ready to buy? 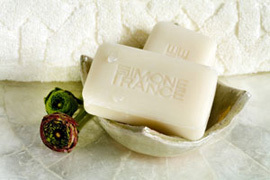 Head on over to Simone France and get ya some of these great products. To enter FIRST YOU MUST LIKE TEXAS KITCHEN ON FACEBOOK. Then come back here and leave a comment about what you did. You may only win a prize once a month on Texas Kitchen. As Always be sure to leave a separate comment on this giveaway page for each thing you did. Giveaway ends August 5, 2012 @11:59PM PST. US only. Winner will be picked via Random.org. If your profile page does not show your email address, please include your email address in your comment. You may post e-mail as: username at domain dot com for security reasons. Winners will be notified by e-mail Please respond within 48 hours, or a new winner will be chosen. I was not a paid for my opinion; however I may have been given a free product for review. Thanks to all of my sponsors and their parent companies for their support in this giveaway. Giveaway Closed Winner Jennifer B.
I have entered your other giveaways, Smokey Mountain Home made candles, etc. I voted for you on PF blog today. I entered the GNU giveaway. I gave you a Boost today. I entered Mara’s Pasta Giveaway. I like you on FB via Amy Zak. like u on face book …..
voted for you on PF blog. I voted for you today on Picket Fence. I entered your Attic Dek giveaway. I am subscribed to Texas Kitchen Newsletter. I Signed up for Texas Kitchen Newsletter. I LIKE TEXAS KITCHEN ON FACEBOOK. I liked Texas Kitchen on Facebook. I like you on facebook. Thanks for having this contest! I “like” Texas Kitchen on FB. I subscribe via email and confirmed. I voted for you on Picket Fence Blogs 8/5/12.